"A blazing fire" – that age-old image of warmth and friendliness in our day of central heating is still a must-have for many homes. 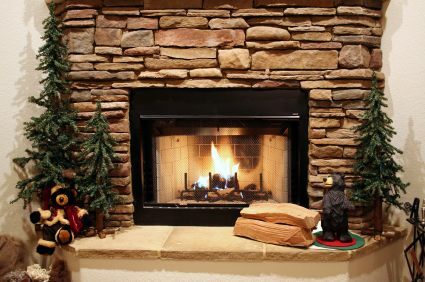 If you're in the market for a fireplace, AAP Construction is your one-stop shop. We at AAP Construction will design a fireplace to suit both your house and your budget. A fireplace can be made of synthetic materials or it can be made of real bricks. The mantelpiece may be classic and simple or ornate and stylized. And a fireplace can be a wood-burning traditional fireplace or a modern one that runs on gas or electricity. We'll give you all the choices you require so you can have the ideal fireplace. As professional builders AAP Construction knows that to you – our valued customer – a fireplace is a source of warmth and provides old-fashioned charm to your room. We realize that you want your fireplace and mantelpiece to look pretty and we'll design just the right one for you. But – again as professional builders – we also know that what's 'behind the scenes' is of equal importance. That's the flue. The flue is the vertical channel between the fireplace and the chimney. Our fireplace will release all the warmth into your room while all the smoke will be directed through the flue and out the chimney. At AAP Construction we don't take a 'one size fits all' approach. We will even precisely size the firebox to suit your living room and your needs, after running the dimensions past you. You don't have to worry about flue, firebox, and such things . . . because AAP Construction does!